the attention to detail that you will notice in every nook and cranny of the building. 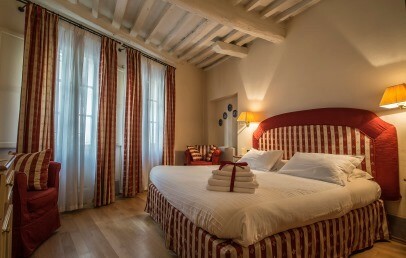 A Palazzo Busdraghi is located in via Fillungo, the main street in Lucca’s old town centre – the town’s lively business and crafts centre. 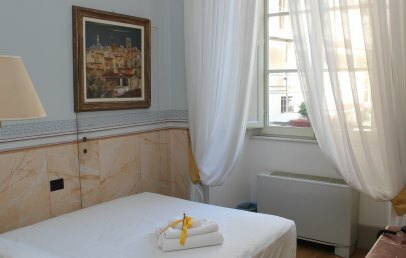 The hotel’s location, just a stone’s throw from Piazza dell’Anfiteatro, is a short pretty stroll away from the town’s main attractions. 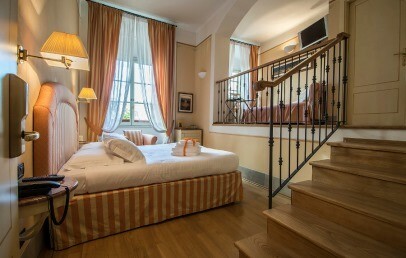 A Palazzo Busdraghi combines the charm of a period residence with the warm hospitality of a small hotel. 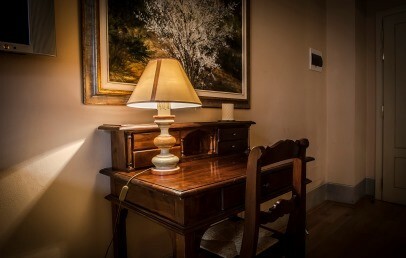 The hotel preserves the refined elegance of the historical building it is housed in and offers an attentive and discreet service and careful attention to detail. Guests greatly enjoy the generous buffet breakfast that varies from day to day and includes vegan and gluten-free options (upon request). 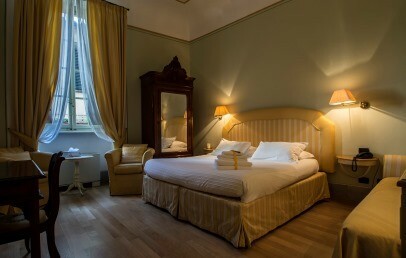 With a classic design and welcoming ambiance, the eight rooms at A Palazzo Busdraghi range in size from 11 to 22 m² and differ from one another in their furnishings and colours. All rooms offer free Wi-Fi, air conditioning, satellite TV, telephone, mini bar and safe. 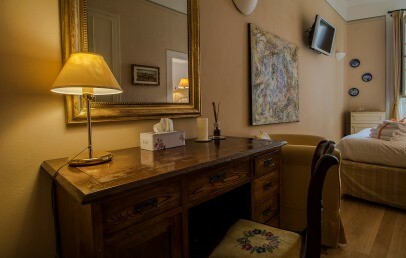 Available to guests free of charge: Wi-Fi, tourist information, maps, itineraries and reservations. Services available at a supplement: car park, laundry and clothes alteration service, airport transfers, in-room breakfast service. Guests can also enjoy a holistic massage upon payment of a supplement. A small full-comfort room, the large single is ideally suited to be used as a single room but can also accommodate two people who want to snuggle up in the large single bed. The room offers an en-suite bathroom with shower, towels and complimentary toiletries set. 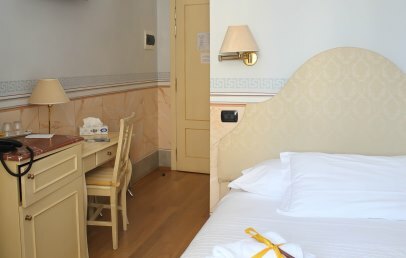 Romantic and comfortable rooms, classic rooms overlook via Fillungo and via Busdraghi and differ from one another in design, colours and furnishings. All rooms offer a desk and comfortable chairs, and have an en-suite bathroom with jacuzzi tub or water jet and steam shower. 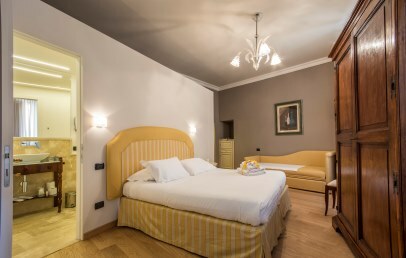 Superior rooms are large and airy rooms with a classic design. Superior rooms offer a double bed, desk, armchairs and a comfortable sofa. 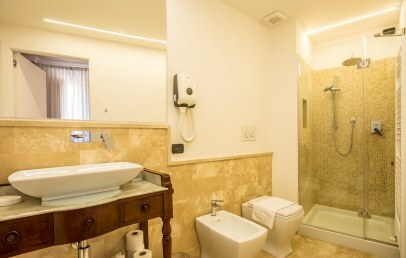 The en-suite bathroom has a jacuzzi tub or water jet and steam shower. 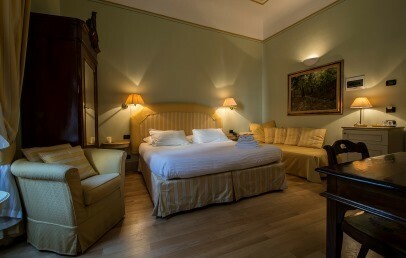 The pride of the hotel, the two deluxe rooms are bright and welcoming. One of the deluxe rooms is split over two floors and offers a double bed, desk, armchairs, sofa and en-suite bathroom with jacuzzi tub. 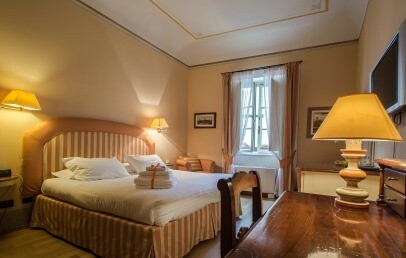 The second is a large room with three windows overlooking via Fillungo and via Busdraghi. It offers a sofa-bed and en-suite bathroom with shower. Room with extra bed are large and airy rooms with a classic design. Superior rooms offer a double bed, desk, armchairs and a comfortable sofa. The en-suite bathroom has a jacuzzi tub or shower. These rooms are ideal for families as a third bed can be added (some rooms can even accommodate a fourth bed, upon request). Special 10% reduction for stays from May 1st to May 31st (minimum stay 3 nights)! Special 15% reduction for stays from May 1st to May 31st (minimum stay 4 nights)!